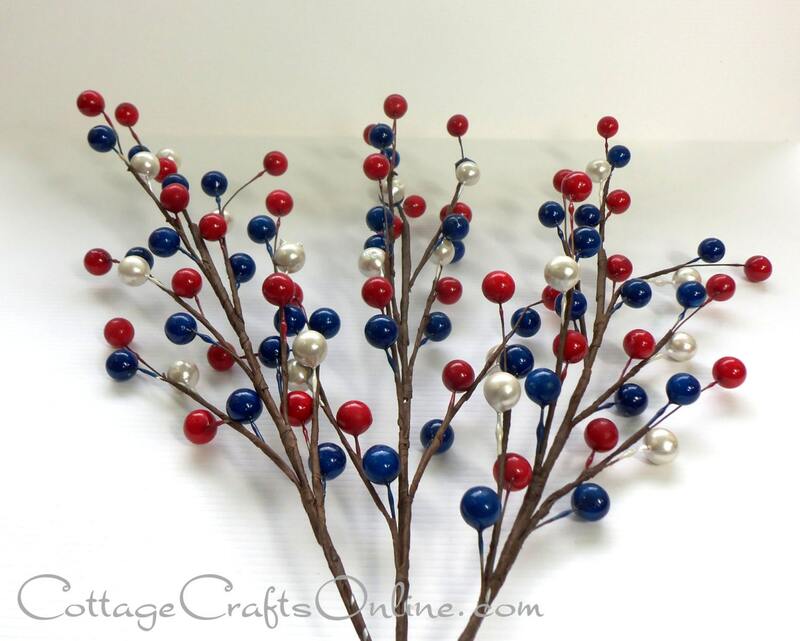 Three red, white and blue American glossy berry sprays, each with 35 berries, 18" overall length, 9" length of berry branches. A product of major craft supply company, Darice.A product of major craft supply company, Darice. A nice addition to patriotic decor and projects. Excellent for July 4th florals and wreaths. PLEASE NOTE: To minimize your shipping cost, the sprays will be shipped with the wire stem bent, as shown in pictures 3 and 4. If you prefer the sprays sent unbent, please ask for a shipping quote before ordering. This listing is for a pack of 3 sprays. RETURN POLICY: Please choose carefully. Once placed, orders for seasonal items, including this item, cannot be cancelled or returned. Delivery was super quick and arrived well before the delivery date. Items were exactly as described and the price was very reasonable. Packaging was awesome. Would not hesitate to purchase from this seller in the future.